Libyan Arab Jamahiriya is a country in northern Africa that is slightly larger than the state of Alaska. It shares borders with Tunisia, Algeria, Niger, Chad, Sudan, Egypt, and the Mediterranean Sea. Its terrain is mostly barren, flat, or plains-and plateaus-endowed. The climate is Mediterranean on the coast, but hot, dry, and radically desert-laden (90 percent of the Libyan territory) at the interior. There are about 5.3 million Libyan residents; 625,000 are African majority workers (500,000) and the remainder are workers from the Maghreb, Egypt, Italy, Malta, Pakistan, Turkey, and Eastern Europe. Ninety-seven percent are Sunni-Muslims, of Berber and Arab descent, and the remaining three percent are from other Arab neighbors such as Italy, Greece, Malta, India, Turkey, and Pakistan. Arabic is the official language, but Italian and English are widely spoken and understood in metropolitan/harbor areas. Since the coup of 1969 against the Idriss al Swnissi monarchy, Col. Muammar Abu Minyar al-Qadhafi (hereafter, Qadhafi) has ruled this oil-rich country, embracing what he baptized "The Third International Theory," an alleged mixture of socialism and Islam. In 1987, Libyan expansionism was stopped as military troops were ejected from Northern Chad (Aozou Strip). During the period 1992 through 1999, UN sanctions were imposed on the Qadhafi regime, particularly in view of the alleged worldwide terroristic activities at the wake of the 1988 Lockerbie bombing. The official name of Libya is Al Jumahiriyah al Arabiyah ash Shabiyah al Ishtirikiyah al Uzma (Arabic) or The Great Socialist People's Libyan Arab Jamahiriya. The term Jamahiriya means roughly "state of the masses." Libya is a military dictatorship. There are 25 baladiyats (municipalities) or 13 aqalims (regions). The country gained its independence from Italy in December 24, 1951, and after the Qadhafi coup a Constitution was introduced which was amended in 1977. Its basic tenets are a legislative unicameral branch or the General People's Congress, whose members are elected via universal and mandatory suffrage across a pyramid of people's committees, local councils, and such. There is one Supreme Court, with the whole legal regime variously predicated both upon civil law and Islamic law ( Shari'a ). At the executive level, Qadhafi is the head of state, with no official title, and Mr. al-Shamekh is the premier or head of government. The opposition is weak, and is based on nationalistic and/or Libyan Islamic tendencies. Libya is a member of a number of international organizations, including the Arab Fund for Economic and Social Development (AFESD), the Council for Arab Economic Unity (CAEU), G-77, IMF, INTERPOL, MONUC, the Organization of Arab Petroleum Exporting Countries (OAPEC), OPEC, the UN, and UNESCO. The Libyan economy is mainly based upon oil exports. In fact, crude oil and refined petroleum goods represent the quasi-totality of exports (US $14 billion), 25 percent of the GDP, and all public revenues ($7 billion). The total real GDP amounts to about $46 billion, and external debt is about 10 percent of this figure. Libya has the highest per capita GDP, about US $9000, but in reality income is very unevenly distributed, as unemployment remains extremely high at 30 percent. The country imports 75 percent of its food and consumer goods, although textiles, food processing, petroleum products, cement, and handicrafts are growing production branches. Some of Libya's trade partners include Italy, Germany, Spain, Turkey, Tunisia, Great Britain, France, and South Korea. The daily newspaper circulation in Libya is very low at 13 per 1,000 people. There are very few laws to protect, promote, and foster a spirit and a practice of open and free press in Libya, despite the constitutional rhetoric and Qadhafi's "state of the masses" or Jamahiriya polemics. In truth, there are only four daily, legislated newspapers in Libya, including the Arabic Al Fajr al Jadid (The New Dawn), published by the Jamahiriya News Agency (JANA). The Libyan state owns and controls the country's media and press systems. No opinions against the military rule are permitted. 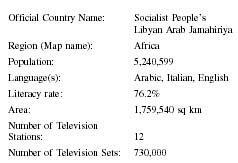 There is, by law, only one Great Socialist People's Libyan Arab Jamahiriya Broadcasting system as the national television broadcast medium. No privately owned televisions stations are allowed. Prior to October 1998, the national radio system was named the Voice of the Greater Arab Homeland. When Qadhafi changed his ideological and geopolitical orientations and partnership to Africa, away from the Arab world and the Middle East, the radio system took on a different name, The Voice of Africa. Some political divergence of contentions and opinions may be allowed within the Majlis or the Libyan Chamber. When it comes to the media and press, however, the rules are strictly censorship-focused. Even self-censorship is imposed upon the Libyan media and press via the use of clandestine informants or spies. For example, on October 1, 2000, media and press matters became "so disturbing" that the Ministry of Information, Culture, and Tourism was disbanded. There are no democratic or competitive media and press relations with the Libyan regime. JANA is under the strict iron hold of the Libyan leader. Qadhafi is notorious for eliminating opponents, particularly in Europe, Egypt, and the Sudan. Qadhafi relies mostly on his family, in particular his second son Saif al-Islam. The foreign media and press, Arab, Western, and Eastern are strictly under the supervision of the military regime. For instance, while Qadhafi stated that all foreign media are welcome to attend the trial of six Bulgarian medics accused of infecting people with the HIV virus, in actuality only a few Bulgarian media representatives were issued visas, while others were blatantly refused. Many media from other countries were also thus unable to attend. No foreign media and press can enter the country without Qadhafi's permission. JANA, Jamahiriya Broadcasting, and Voice of Africa are closely monitored and used for the regime's propaganda. Any journalist, media, press, or newscasting system that criticizes Qadahfi's Jamahirya may be immediately suspended, arrested, or even disappear. According to World Press Freedom Review, Mr. Abdullah Ali al-Sanussi al-Darrat, journalist of the Benghazi's Al-Zahf Al-Akhdar (The Green March), was suspended in March 1998 due to "his articles attacking fraternal Arab states and friendly countries." Other members of the same publication were later suspended. Mr. Al-Darrat disappeared. All Libyan media broadcast systems are solely under Qadhafi's control. In late October 2000, it seemed that Qadhafi agreed with the French government on a "program to assist employees in the media sector [that] will allow Libya to benefit from cutting edge media and telecommunication technology" (World Press Freedom Review). There are about 8,000 Internet users, with only one Internet Service Provider (ISP). Internet use is closely monitored. There are numerous sites related to Libya but few of them are run from within the country itself. Primary and secondary education is compulsory in Libya between the ages of 6 and fifteen. Only about one-fifth of college-age people in Libya attend a university. There are many universities, colleges, and institutes in Libya, particularly in Tripoli, Benghazi, and Sabha. Education output has grown remarkably since the beginning of the Qadhafi regime, climbing up from about 35 percent to 80 percent in 2002. In the field of journalism, media, and press there are a few programs, especially in Tripoli and Benghazi. Many journalists possess media and journalism degrees from Italy, England, the USA, or the Arab world. Despite a few recent measures to liberate the press and media in Libya, the information and press systems in that country are clearly controlled by the Qadhafi regime. The removal of the sanctions and the media globalization are major potential emancipators of this sector of the Libyan society and economy. The press also has the opportunity to play a role in leading the way to this change, but it has not yet become involved in this conflict. Afrol News, 2002. Available from www.afrol.com . American Political Science Review . Washington, DC: American Political Science Association, 1998.
International Press Institute, 2002. Available from www.freemedia.at/ . Sarri, Samuel. Ethics of the International Monetary Systems . Philadelphia: University of Pennsylvania Press, 1998. World Almanac and Books of Facts . New York: K-III Reference Co., 2002. It is in conection with a panafrican Magazine concerning art and culture that will be launch in South Africa; we kindly request from your media to please connect us with the person in charge of art and culture so that we can collaborate in a mutual benefic. Do not hesitate to reply to us as soon as possible. I am please to inform you that Radio Libya is my Best so far, and i would like to have the address of Radio libya Hausa Service,that Muryan babbab jamhuriya, the e-mail address, the web-site, the Box. anticipating your reply, and wish you all the best.